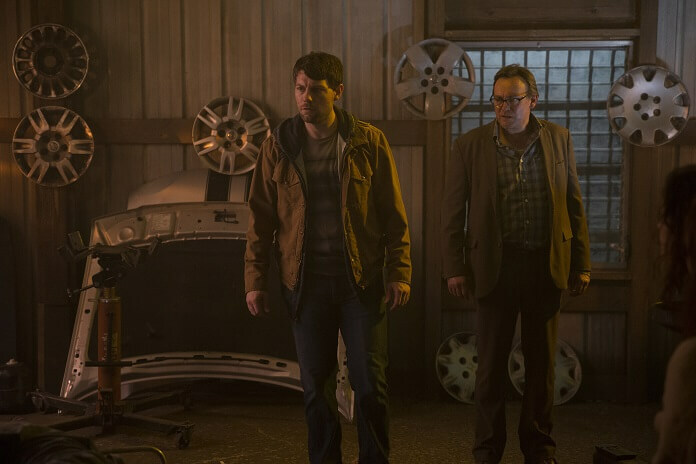 Season two of Cinemax’s Outcast continues with four new episodes airing in August 2018. The series is based on the Skybound/Image comic created by Robert Kirkman (The Walking Dead) and artist Paul Azaceta. Outcast stars Patrick Fugit (Gone Girl) and Philip Glenister (Kingdom of Heaven) and airs on Fridays at 10pm ET/PT. In addition to Patrick Fugit and Philip Glenister, the season two cast includes Wrenn Schmidt (The Looming Tower), Reg E. Cathay (The Wire), Kate Lyn Sheil (House of Cards), Julia Crockett (Law & Order: Criminal Intent), David Denman (13 Hours), and Brent Spiner (Star Trek: The Next Generation). The Season 2 Plot: Plagued by demons since childhood, Kyle is on a journey to find answers – but what he uncovers could mean the end of life as we know it. Continuing to probe the mystery of what lies behind the town of Rome’s supernatural manifestations, and why they are drawn to Kyle, the show explores how people cope with extreme circumstances while protecting the ones they love. Patrick Fugit stars as Kyle Barnes, a young man who has been plagued by demonic possession all his life. With the help of Reverend Anderson, played by Philip Glenister, a preacher who believes he is a soldier in God’s holy war against the forces of evil, Kyle tries to protect those he holds most dear, now that the otherworldly threats prove greater in scope and number than anticipated. His struggle will grow into a fight for all of his hometown, as he discovers the haunting secrets of his own past. Kyle (Patrick Fugit) and Amber (Madeleine McGraw) visit Allison (Kate Lyn Sheil) at the facility she’s checked herself into, where Amber encounters a creepy patient. Holly (Callie McClincy) rejects Megan’s (Wrenn Schmidt) attempts to return to normalcy. Sidney (Brent Spiner) poses a challenge to a new convert. Patricia (Melinda McGraw) confronts Giles (Reg E. Cathey) about his investigation of Aaron’s case. Anderson (Philip Glenister) and Kyle track down a mysterious figure behind a spate of Rome abductions. Written by Jeff Vlaming; directed by Howard Deutch. Kyle (Patrick Fugit) and Anderson (Philip Glenister) learn more about the role Kyle’s father played in Rome’s history of possession. Anderson is taunted by an old foe, who recently resurfaced and is wreaking havoc in town. With nowhere to go, Megan (Wrenn Schmidt) takes Holly (Callie McClincy) to a familiar but forbidding place. Sidney (Brent Spiner) instructs an ally to keep Giles (Reg E. Cathey) in line. Written by Rebecca Sonnenshine; directed by Alrick Riley. Kyle (Patrick Fugit) tracks down Megan (Wrenn Schmidt), who rejects his assertions that Rome’s dark forces are real. Allison (Kate Lyn Sheil) considers checking out of the hospital after disturbing encounters with patients and staff. Anderson (Philip Glenister) discovers he shares a connection with the congregants of Dakota’s (Madelyn Deutsch) church. Owen’s (Toby Huss) town-hall meeting for concerned citizens turns chaotic after a surprise announcement. Written by Chris Black & Adam Targum; directed by Ti West. In the aftermath of an epic fight to save Giles (Reg E. Cathey), Dr. Park (Hoon Lee) obscures the truth about Kyle’s (Patrick Fugit) condition to Anderson (Philip Glenister), Megan (Wrenn Schmidt) and Allison (Kate Lyn Sheil), while Amber (Madeleine McGraw) discovers she shares some of her father’s special abilities. Sidney’s (Brent Spiner) latest plan gets derailed by his unpredictable protégé. Rose (Charmin Lee) begins to take matters into her own hands after Giles quits the Rome police force. Written by Sarah Byrd; directed by Fernando Coimbra.